Celebrity chef Marut Sikka's latest venture in the city. Finally doing what he does best and that is Indian cuisine. Here traditional Indian meets contemporary, where creative Indian doesn't equal inedible Indian! Best part here is the thali where control freak like myself can pick and choose 6 items from a smaller menu to create their own thali from scratch, plus 2 breads and dessert. What more can you want. 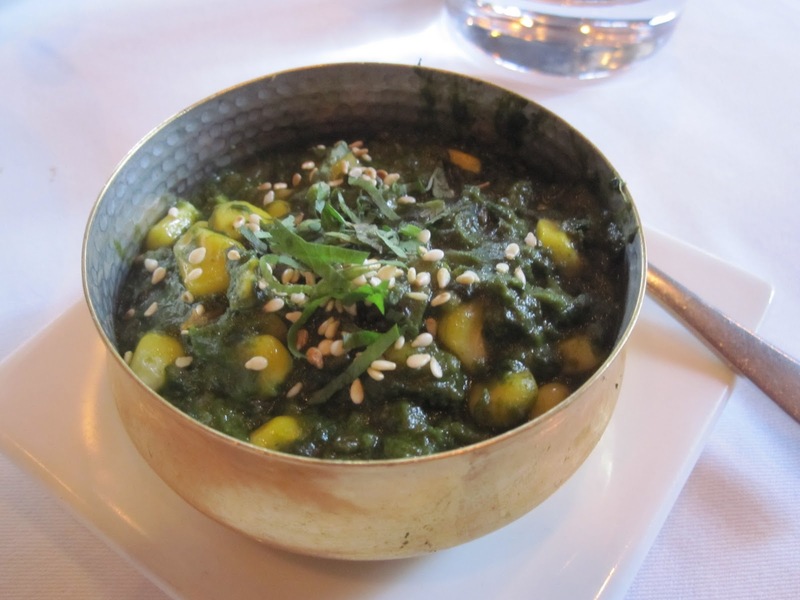 Spinach Chaat - Though i discovered this one a little late in life, it is slowly becoming one of my favourites! Gram flour coated, fried crispy spinach leaves, doused in cold yoghurt and sweet tamarind chutney. I would have preferred a little more spinach, as you had to really search for it through the mound of yoghurt. And its easy to forget that there is still deep fried involved in this seemingly healthy dish. But we all know if healthy is what i wanted to be, this blog would have very little content!. 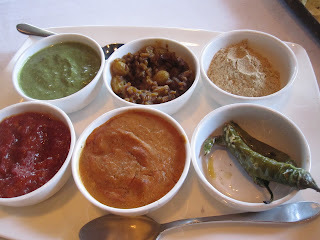 Accompaniments - Clock Wise from top left - Coriander Chutney, Fenugreek Seeds w/ Raisins, Chaat Masala, Tomato Chutney, Garlic Chutney, Fried Stuffed Green Chillies. Shutrus is what they call these 6 - Shut in sanskrit meaning 6 - the variety is to appeal to all tastes, salty sour, spicy, sweet. Ones in bold were my favourite. The garlic chutney was not bad either. 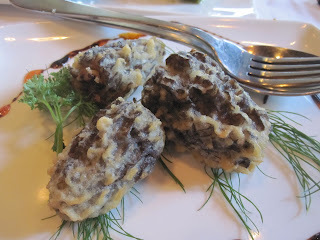 Fried Morels stuffed with Roasted Almonds, Pomegranate & Chilli. Both my friend and I thought it was a real waste of morels to deep fry them! Between the batter and the strange stuffing you could not even taste this deliciously earthy, creamy mushroom. The stuffing, well for some reason, it tasted like cheese, which does not quite add up given its absence in the description. I think this is one of those contemporary concussions that's best left in the past. 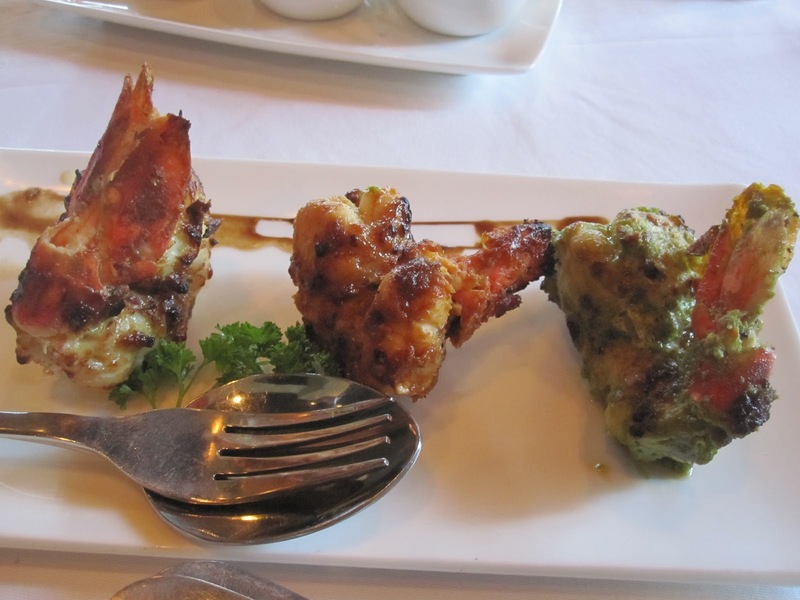 Trio of Jumbo Prawns - Yummy! Definitely a must order. Starting from the left is Royal Cumin, Goan Peri Peri and Coriander Fennel. Cumin had a mellow flavour that smoothly rolls around your tongue. 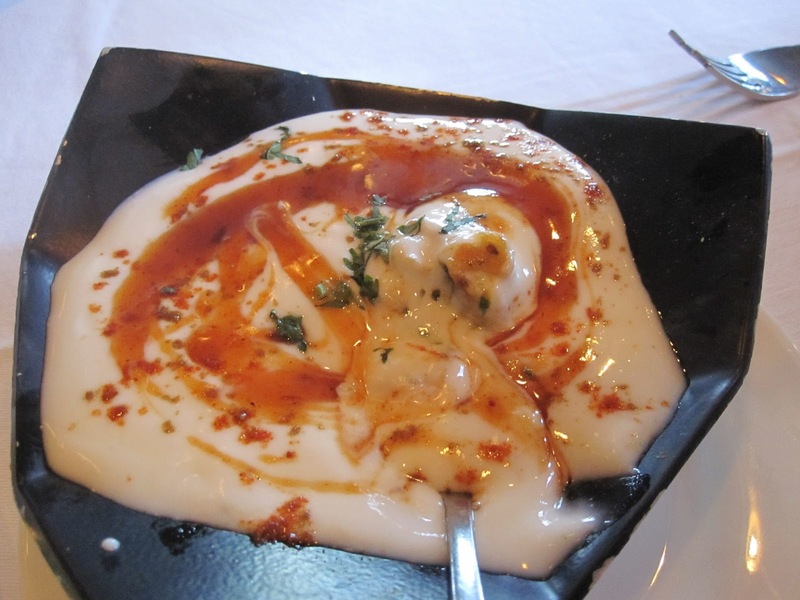 The marinade tasted a bit like a malai tikka . The Goan Peri Peri was a nice hot tangy teaser. The Coriander Fennel was probably my favourite. Dum Ka Keema - Not quite keema as the description in the menu will explain. 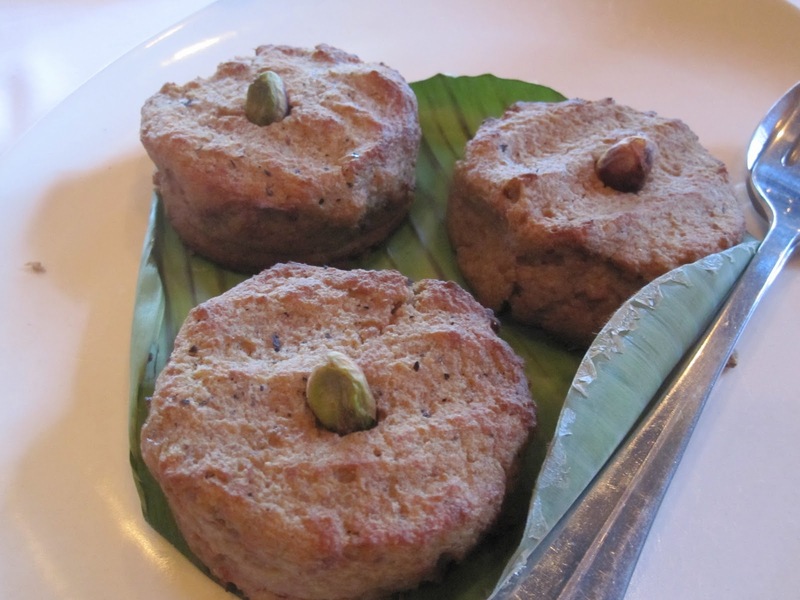 They are basically gulati kababs where the meat has been cooked and tenderized to a pulp, so your delicate tongue may not have a bump to deal with. Anyway despite the laborious preparation I thought these kababs were quite BLAH and not worth ordering again. It was just a big pastey blob, with not much moisture or flavour to tempt you to keep eating. 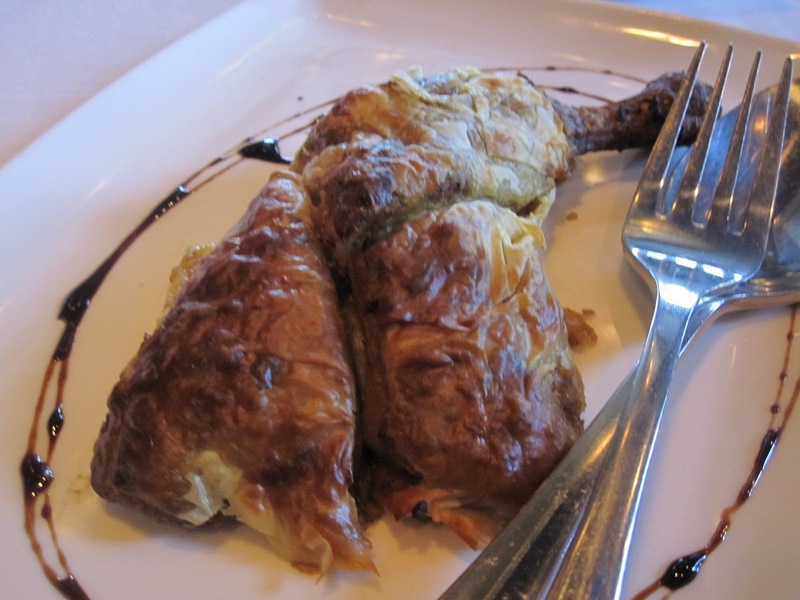 Roasted Whole Leg of Chicken, Roti Wrapped, stuffed w/ Apricot Chilli Masala- Very interesting. Its one of their specialities, go figure! Lets just say I'm glad I tried it but I don't know if its something I would order again and again. May be a little too funky for my liking, I'm not the biggest fan of saffron either, which it included, I just find it too overwhelming. 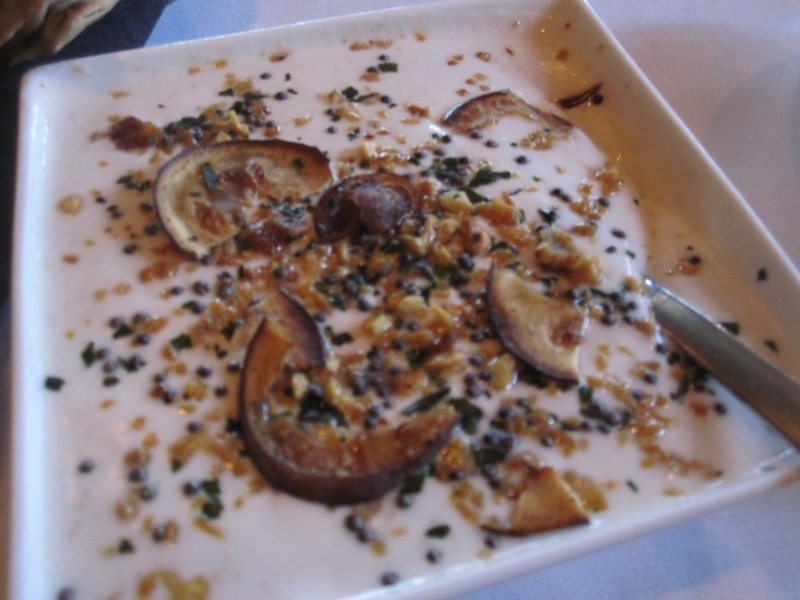 Cripsy Eggplant Raita w/ Curry Leaves, Fried Garlic and Mustard Seeds - I don't know if this is something traditional I have missed out on or an innovation of theirs. Either way it was delicious. Seeing the potential of an ordinary raita, turned in to this got me strangely excited! 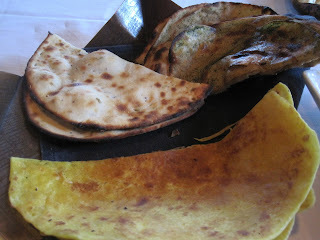 Assortment of Breads - Methi Paratha (good) Khasta Roti (least favourite, for no direct fault of the roti, just not my thing), Ultha tawey ka Paratha (Not bad, I always love the sweetness this one has). Khatti Macchi - This may not be the most unique thing you have eaten. In fact I'm sure you have tasted something like it before, I definitely had. Regardless, it was pretty delicious, especially with some laccha parathas! 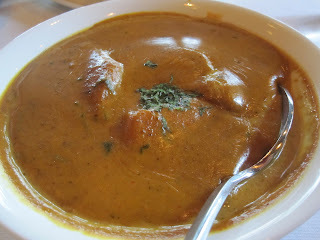 Cubes of sea bass in a yummy tamarind curry. Sour, creamy, with a hint of sweet. Paalak Makai - Creamy spinach with corn - All the meat on our table and my momentarily healthy brain forced me to order this. Was quite good. Quite the staple that should not be messed up! 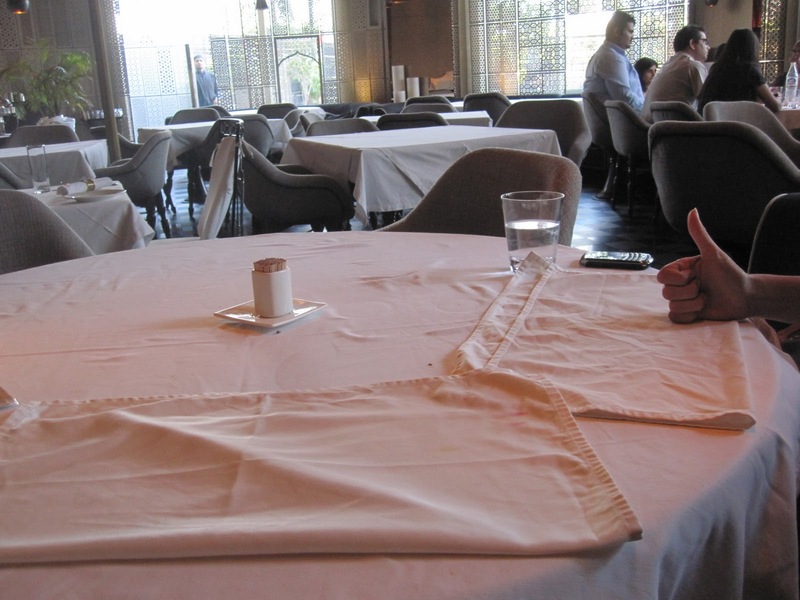 Must always have a clean table before you start dessert in my opinion - Even if it means covering numerous stains and blotches with your napkin! 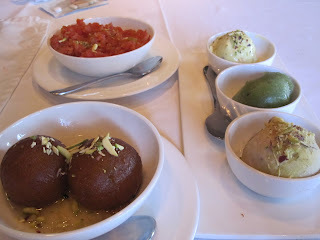 Desserts - Clockwise from top left - Gajjar ka halwa, now this was the strangest one I have ever eaten. I kid you not it tasted like raw meat. What was funny is my Korean friend said it tasted like Korean short ribs that confirmed that my taste buds hadn't finally given up on me! If it was not for the yummy trio of kulfi that followed my tongue may have been permanently traumatized! Trio of Kulfis included; pistachio, which really could have done with a lot more pistachio because if the pale white colour did not give that away trust me the flavour sure did. 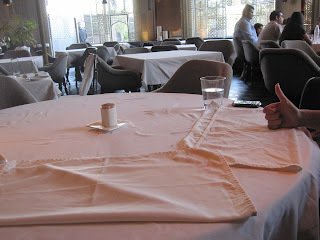 The Mango Panna sorbet was a nice, sour, sweet, respite. But the ruling queen of all the kulfis here was the Fig Kulfi. It had this yummy toffee flavour, along with nice generous chunks of figs, was just divine. Lastly the Gulaab Jaamun, one of my favourites, cannot go too wrong with it. Get it if you're in the mood for a comfort blanket, that keeps you warm and fuzzy inside. We stuck to the basics because I wanted my friend to get a taste of all the traditional favourites. But next time I am definitely trying the steamed youghurt topped with passionfruit infused figs. Tres exotique n'est pas? Budget: Expensive but not over the top. For all the ELEVEN dishes we paid Rs.5000 something.